Her work as executive head of public affairs at Anglo American puts Yvonne Mfolo at the forefront of community involvement. Through her endeavours, the Anglo Inyosi Coal Community Trust was established and she also oversees the Community Development Trust. Mfolo completed a degree in BA Communications at the former University of Bophuthatswana in 1992. She was appointed executive head of public affairs at Kumba Iron Ore in 2011 after working as head of public affairs at Anglo American’s Thermal Coal business. Prior to this she worked as chief director of communications at the former Department of Minerals and Energy for nine years, where she was spokesperson for the minister. She initiated the Kimberley Process and the African Mining Partnership during her tenure at the Department of Minerals and Energy, as well as the African Mining Partnership, which aims to achieve the New Partnership for Africa’s Development (NEPAD) objectives in the mining sector. Thirsty for knowledge, Mfolo has qualifications in politics and international politics from the University of South Africa, advanced journalism from the Institute for Advanced Journalism, petroleum policy and mining policy from the Minerals and Energy Training Institute, advanced management and finance for non-financial managers from the Gordon Institute of Business Science (GIBS). She is currently enrolled for an executive MBA from the Henley Business School. She has received recognition in the form of an award in the sustainability category of the 2012 Nedbank Capital Green Awards and was a runner-up in the same category of the 2013 Nedbank Capital Green Awards for Batho Pele Mobile Health Units. She also achieved the highest score in Anglo American for the Anglo Social Way Assessments in 2012, 2013 and 2014. Her expertise is employed in various committees and boards. 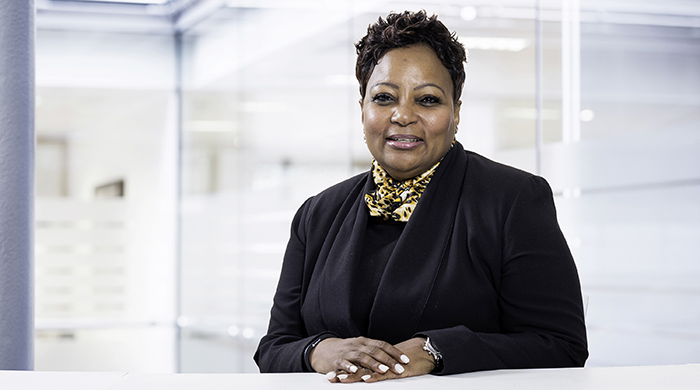 She is a director of Anglo American Zimele and the Mineral and Petroleum Board, and serves as trustee for the Anglo American Chairman’s Fund and the Sishen Iron Ore Company Community Development Trust. In addition, she serves on Chamber of Mines Committees, as well as on Anglo American’s various internal and Group-wide committees.